I promptly updated ye olde resume to include “published author”, gave a copy to a friend of mine who was starting a business, and set about to reading it. How long does it take to be a successful blogger? What is your biggest tip on writing a successful blog post? Speaking of timescales in blogging — recognize that you will be blogging until you stop blogging. That sounds simple, but many peopole start out with a burst of post-every-day fever, which they cannot sustain over the long haul. Pick a pace which is predictable and sustainable. In my defense, it sounded a lot more credible when I wrote it. I recommend… that you get familiar with two groups of websites in your niche: the folks who have achieved something close to what you want to achieve, and the folks who are on the path to success but just a wee bit farther than you are. The first give you examples to emulate and objectives to strive for, and the second should become your new best friends, because a) they’re not too busy yet that they have millions of admirers and b) their support can really kick start your blog and help you both get closer to your goals. As usual, I don’t have any monetary interest in the book or in your purchase of the book. (i.e. those are not affiliate links) I contributed to the book because Steph asked me to, and it was a pleasure to contribute a small bit to something which will hopefully provide value to people. If you’re one of those uISVs scratching your head thinking “So I’ve heard them say 432 times ‘Blogging helps for marketing’ but I don’t consider myself an expert at this yet”, read the book. I guarantee you you’ll learn something. P.S. Seth Godin is one of the world’s best living theorists about marketing. I am not Seth Godin. You are not Seth Godin. Please, for all that is holy, don’t write list posts. P.P.S. uISVs will recognize more than a few names: Ian Landsman, Bob Walsh, and Andy Brice all contributed chapters. P.P.P.S Remind me to get the contact details of whomever did the cover design if I ever publish anything. 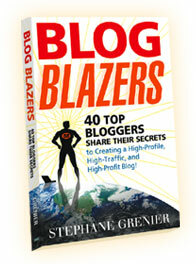 Cover of Blog Blazers book, depicting man with BB on chest standing atop world.